She was singing along to The Schuyler Sisters from the Hamilton Musical soundtrack when I interrupted her. YES!, she said, cutting me off. It's not that I didn't want to go to Grandparents Day but I was sort of hoping she'd let me slide for reasons I can't write about in deference to my kids. Grandparents Day fell on the same day as Valentine's Day so it was a double whammy of celebrations. My workload that morning was heavy as usual but I woke up excited for the eventful day. When I walked into the school office to check in I scanned the doorway and noticed the number of people who filtered in and out. I had a fleeting thought, jeez, anyone can just walk in here and start shooting. I hated myself for having those thoughts but can anyone blame me? If my mind were a movie screen in that moment you'd see how unfairly I profiled the people signing in after me. My grandkid and her classmates were engrossed in making their special crafts for the grandparents. The room moms, including my middle spawn, were busy with their room mom duties. I hovered in the background watching everyone until my daughter snapped at me to engage with my grandkid. I told myself to relax and enjoy the moment instead of indulging my paranoia. So I helped the grandkid finish the crafty magnet all the kids were gluing together for their grandparents. Driving home afterward I chided myself for being a total paranoid freak. Nothing happened, I thought to myself. With Grandparents Day down I had the rest of the day to celebrate all the glory cheesiness of Valentine's Day. I had the biggest smile as I walked through the front door of my house eyeing the bouquet of red roses my dude got me. My smile withered quickly when I heard the news reporter's voice coming from the t.v. he was watching. I ran to the living room and watched in horror as the t.v. screen was showing another school shooting, this time at Marjory Stoneman Douglas High School in Parkland, Florida. At that time the death count was only at 14. Ha, only. The rest of my day was pretty much shrouded in heartbreak and tears as I learned that 17 people died because 19-year-old Nikolas Cruz walked into the high school with an AR-15 semi-automatic rifle with the sole intent of killing. Valentine's Day forgotten, I spent a few hours alone that evening either weeping in despair or seething with anger trying to process the senselessness of the shooting. I sat in my car in a strip mall parking lot and remembered how earlier that day I laughed at myself for being a paranoid grandmother at an elementary school. I seriously shook my head at myself for believing I couldn't visit my grandkid's school without low-key profiling other grandparents. As of May 2018, there have been 23 school shootings where someone was hurt or killed. That averages out to more than 1 shooting a week. This is the America we live in. The land of the free is now the land where my fourth-grade grandchild comes home and tells me they had a lock down drill instead of doing fun things. My teacher talks about bad stuff all the time, she lamented. Bad stuff as in what to do when the bad guys with guns start shooting people at school. As most of us do when we're feeling all kinds of pissed off we take our rant to Facebook, Twitter or Instagram. If not to change minds at least to unload the heavy burden from our chests. I took to Twitter hoping to alleviate the boiling level of my anger which quickly turned to disbelief when my feed showed a stream of adults bullying the Parkland teens fighting for gun reform. More shame, more anger. Yet, also more hope. The teens from Parkland weren't taking this sitting down. They galvanized a movement and called it March For Our Lives encouraging young adults to register to vote. I started this post at the end of March right after the March For Our Lives event in Los Angeles. Obviously, it's taken three months for me to finish writing it what with world events happening at breakneck speed. I can't keep up. The inspiring kids from Parkland are touring the country lobbying for stricter gun control, speaking up against gun violence and encouraging people to vote. Those kids are our future and their fervor to create change is one of the reasons why I marched on Saturday, March 24th. You've seen their faces on t.v., social media, magazines and online newspapers: Cameron Kasky, Emma Gonzalez, and David Hogg to name a few. While dealing with the aftermath of losing their friends during their school's Valentine's Day massacre they've been attacked on social media and accused of being actors by adults. ADULTS! 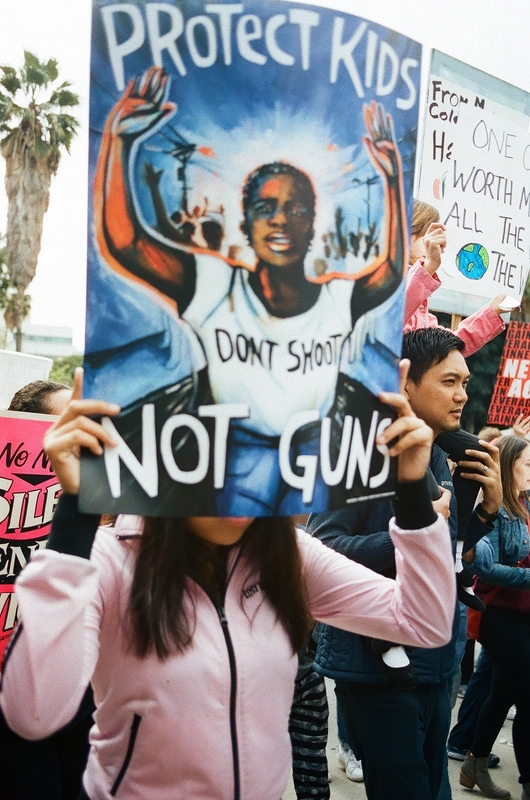 Instead of enjoying spring break and living like carefree teenagers facing college prospects they're using their voices to create change in a broken system. 5. Limit firing power in the streets. As I've repeated many times to people who oppose the change these kids are fighting for I'm not advocating for the disarmament of responsible gun owners. Newsflash, we are responsible gun owners. In a perfect world (or perfect country) my granddaughter would have the freedom to go to school without the fear of shootings looming over her head. Is it too much to ask that my granddaughter doesn't come home to tell us how their day was spent in practicing lock down drills while her teacher "talks about bad stuff"? Or what about my daughter-in-law who's employed in an art school where they practiced lock down drills so much that when a real one finally happened they sprang into action without hesitation. They immediately barricaded themselves in the classroom for an hour and a half until the campus was cleared of all threat. Is it too much to hope for a world where my daughter-in-law, who was seven months pregnant, doesn't have to barricade herself in a classroom with her students due to an imminent threat on campus? Are my concerns legit? Am I wrong to want to protect my grandchildren, daughter-in-law and other innocent children from gun violence? This problem won't disappear on its own as the number of victims of gun violence continues to grow. We need to be part of the solution. We have to back these kids up who are touring the country helping others to register to vote and educating them on gun reform. Head to the March For Our Lives website to find out about #RoadToChange or text CHANGE to 977-79. 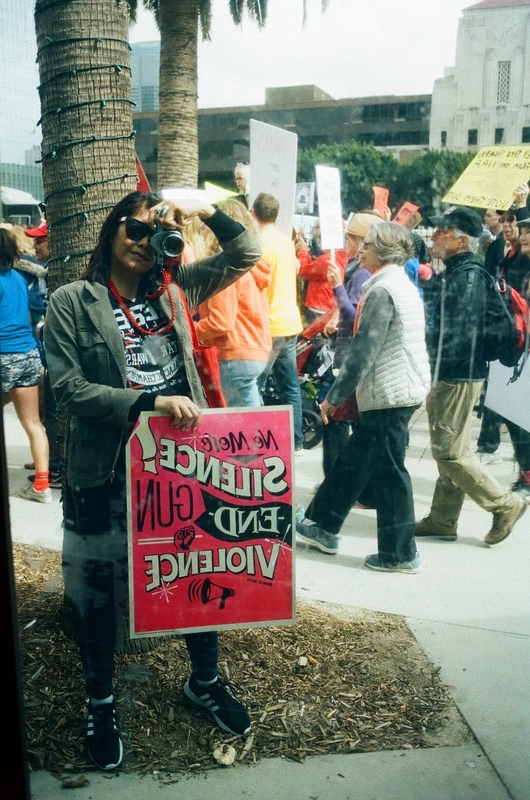 Head over to my photography blog to see the rest of the images I shot from March For Our Lives.